C4 On the Go pack all the same ingredients you’ve come to love in the original version, now much easier to take with you to the gym! The new C4 RTD has a much slimmer “Explosive Energy Blend” than it’s powdered C4 brethren. 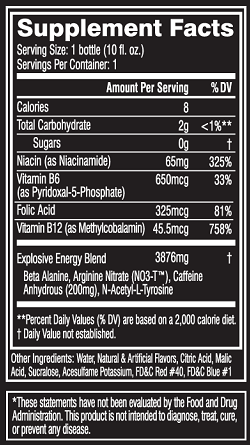 Gone are ingredients like TeaCor, which is a form of theacrine, Creatine Nitrate, and Velvet Bean. This is a shame because we have really come to like the combination of theacrine and caffeine. If you haven’t heard of theacrine yet, it’s a plant extract that functions similarly to caffeine but without creating a tolerance to it. It also synergizes with caffeine for improved energy and mood (click the link above for more information).